This Melon Fruit Salad is so fresh, yummy and sweet. 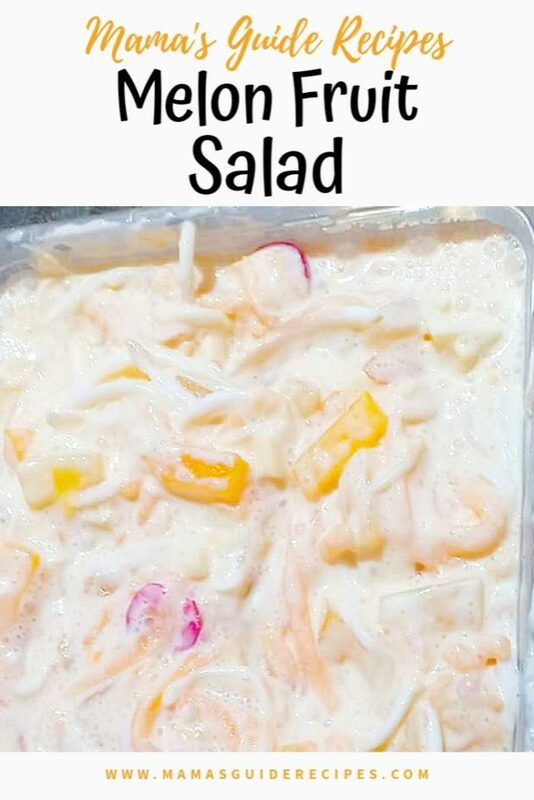 In fact, you can opt to use just pure shredded melon (cantaloupe) and young coconut strips if you’re in a budget and it will still turn out delicious! Prepare young coconut meat, use a coconut scraper (pangkayod) to shred young coconut meat. Transfer it into the prepared mixing bowl for salad. Do the same for melon, scrape it like the shredded buko strips. Add it into the mixing bowl with buko strips. For the fruit cocktail, drain it from juice and use a strainer to let it drip for a few minutes before adding in the mixing bowl. Add all ingredients into the mixing bowl and mix it until well blended. Transfer inside the fridge and let it chill for about 2-4 hours before serving. Serve and enjoy! You may also garnish with grated cheese if preferred.